With one listen to Edens Edge, it is obvious this trio has created a sound shaped by their individual influences. Following the success of their single “Amen” the young musicians from Arkansas — Hannah Blaylock, Dean Berner, and Cherrill Green — are making their debut on Big Machine Records with a vibrant sound that honors country music’s roots while creatively pushing the envelope. Country Music Chicago recently chatted with the country newcomers about how life has changed since releasing “Amen” and what the group has in store for 2012. How did everything come together for you to form Edens Edge? Hannah: We were all born and raised in Arkansas and we met there through family friends. 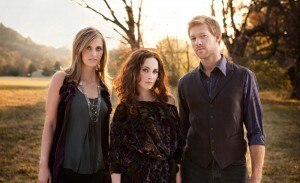 The three of us moved to Nashville in 2007 and we worked with this amazing, historical songwriter named Kye Fleming. She wrote a bunch of amazing hits. She mentored us and developed us and got us in front of the wholemusic business when she got inducted into the Songwriters Hall of Fame. One of the people that were at that dinner that night was a man named Scott Borchetta who owns Big Machine Records and that’s how we met with our label. We met in 2009 and signed with them in 2010. This past year has been a whirlwind and so much fun. We got to release our first single to country radio and we were just so blessed by the support we felt through that. Now we are about to release the second single that we are really pumped about in about a month. We’re really excited for everyone to hear our new music. A lot has happened for you since you moved to Nashville. What has changed most about your lives? Dean: I think the thing that has changed the most is having to get used to being on the road all of the time. When we were playing back in Arkansas we traveled maybe once a week or twice a week and then we moved to Nashville and we were pretty stationary for the first couple years. We have been pretty much on the road the whole time for the past year or year and a half. Its really been amazing to get to the see the country and get to meet so many people and get to know all the people in country radio across the country. That has been a huge blessing, but it has been a big transition in our lives. Let’s talk about the song that helped start it all for you, “Amen” – how does it feel to play it live every night in front of your fans? Cherill: We are really loving it! It was our first single to go out to radio. We have been together eight years., so I guess it took us eight years to get to the radio, but we really enjoyed it. We got to be on three major tours this year – Brad Paisley, Reba and Lady Antebellum – and we have been to a lot of cities in the US. You could really tell as it was moving up the charts how more people at each show would know the song. You can’t really explain the feeling of how moving it is to see a big mass of people in front of you singing lyrics that you poured over. You are up there just jammin’ and having a good time and doing something you love, and people are into it and touched by it and singing along with you. It is an amazing experience! You recently announced that you are going to go on tour with Rascal Flatts this summer – what are you looking forward to most about that tour? Hannah: I’m really excited! I think all three of us are really pumped about all the things we are going to learn from just being on the road with such amazing musicians. We’re huge fans of everybody on the tour and we’re really excited that they’re all bands. We’re a trio group and then everybody else is a band as well, so its really going to be an educational experience for us because we are going to get to learn from the best. We’ve already met all the people that’s going out on the tour, so it will be really fun to get together with friends and travel around like a little circus – it will be fun! You will be playing Joe’s Bar on Friday (February 17th). Chicago is excited you will be here – have you played Joe’s before? Cherill: Yes, we actually played it last year. We played a show with our label mates, The Band Perry and Sunny Sweeney. It was just when we were first getting rolling this past year, but we really loved the venue. We are excited to get back there and have some Chicago pizza and enjoy the city! Absolutely. What else do you have in store for 2012? Hannah: Right now, we are going around and playing in theaters and doing some festivals…and more intimate locations and venues. We’re so excited to be on the Rascal Flatts tour and we’re going to get to be in front of so many awesome country fans, but its really cool this time for us before we get on the Flatts’ tour. It is a cool time for us to get out there and play a longer set where we have a more intimate atmosphere with the fans we have already made. We’re playing longer sets now in those venues and we’re releasing the new single. We are keeping busy for sure and then starting up the Rascal Flatts’ tour. And that is lasting for five months, they haven’t even posted all of the dates for the tour yet, so we’re really excited about the length of the tour. We’re going to get to go everywhere! What advice do you have for singers and songwriters who are trying to break into the industry? Dean: One thing that we all three did was we had a lot of great artists and great songwriters that we really looked up to and we studied what they did. You try to emulate your heroes when you are learning and eventually you kind of develop your own style after a while. Just playing as many shows and writing as many songs and learning about the business is also a smart thing to do. There is a whole business side to the music industry that we didn’t really know about when we were playing in Arkansas, but when we moved to Nashville we tried to get as educated as we could. I think that really helps give you a leg up on the competition. And really having somebody that believes in you…I think that can really help you to develop and help you to not make a lot of mistakes. Great advice. We are looking forward to you playing in Chicago! Good luck with the show. Edens Edge is playing at Joe’s Bar tonight, Friday, February 17th. Tickets are still available on ticketweb.com or at Joe’s box office.